I know this is supposed to be a blog by someone who makes jewelry but I also have a personal life and it has interfered with my intentions the past few weeks. This past weekend was not a very happy Father's Day for me. You see, early Sunday morning, my Dad, Leon H. Maurer, passed away. When I saw him last, he seemed happy and on his way to a full recovery from the bypass surgery. I guess it wasn't meant to be but at almost 87, he had a pretty good run. He was always talking about creating a family business and he loved the fact that I followed him in being the artistic one in the family. 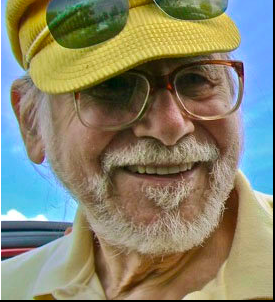 A veteran of WWII, in his own words, Dad was a Philosopher, Scientist, Artist, Writer, Engineer, Inventor, Animator, Producer, Director, Musician, Consciousness researcher, Generalist, (Jack of all trades, master of one, having fun). The last was definitely most true. He did know how to have fun. He invented the Musicane, propounded the theory of Cosmogenisis, and, together with his brother, Normal Maurer (comic book artist, film director, son-in-law of Moe Howard of the Three Stooges), co-invented Artiscope, a “full animation-by-automation” system (per Leon’s resume, “Realistic character animation without artists – world’s first practical “real-time motion capture” system”). They also worked together on developing Cinemagic which my uncle used in the 1959 production of "The Angry Red Planet." Dad was a very talented person and quite handsome, if I do say so myself. A New York City resident and Central Park character for years, he moved to Florida about 6 years ago. Though we were never really very close, I learned a lot from my Dad and I'm glad I had the chance to know him a little better and spend time with him these last years. I am going to miss him, in my own way. Funny, as much as we seem we're prepared to lose an elderly parent, even one we didn't know very well, it's still strikes deep and it's hard to say goodbye. I'm having a bit of a hard time with it but am very, very grateful to have two brothers, whom I love very much, to share this loss with. We loved him. Each in our own way. And he loved us. Of that I'm very sure. So wherever you are, Pops, RIP! I know I promised to write at least once a week but with my Dad in the hospital, he's gotten worse, I just haven't given much thought to it. Today, however, I'm home and can't visit Dad because I have a killer cough and they won't let me into ICU. He just had a stent put in and tomorrow goes in for triple bypass surgery so we take no chances with even the slightest possibility of his catching something from me. While I'm sitting here, twiddling my thumbs and toes and coughing, I thought I'd tell you about a few things. New friends can be found in the strangest places. While standing in line at the grocery store, waiting for your coffee at Starbucks, getting your nails done or bringing in some shirts to the Cleaners. Well, there I am, sitting in the Surgical/ICU waiting room earlier this week, with one of my best friends, Deb, waiting for Pops to come back from a "procedure" so I can brush his hair and get it into a comfortable pony tail. Yup, my old man's a hippie from way back when and his hair is past his shoulders. LOL But that's another story. Anyway, while sitting around, naturally we start talking to each other and to the other people in the waiting room. It turns out that one of the women sitting there is a fellow beader and jewelry maker. But wait, she also lives in the condo complex right next to my development! Talk about your small world. What's more, she has an Etsy shop, ElegantNFunky, and is a member of the Florida Etsy Street Team. So how come I have to go to a hospital waiting room to meet someone I should have met awhile ago? Well, it really is a big, small world, and we make it larger by not reaching out when we get the chance. I've been making jewelry for 3 years now, been a member of FEST for almost as long and should have known that some of my fellow FEST members may just live nearby. 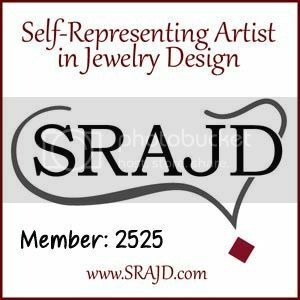 So, I urge you to go check out who's really in your local guild, whether you make jewelry, sew clothes, crochet, knit, craft, paint or sculpt, really look around at the members and see who just might be your neighbor. As I said, friends can be found in the strangest places, but only if you really look. Okay, I promised last week that I'd try to write something on the blog at least once a week. Problem is, I just don't really have a lot to say. Alright, that's not strictly true. Just ask any one of my friends and they'll tell you sometimes the problem is that I don't shut up. But writing is a completely different animal. Especially when you know it has the potential to be read by the World! That's world with a Capital W meaning, anyone, everyone, anywhere. Well, let's see what happened this week. Some of my jewelry got listed on two, yes two, collections over at Artfire this week. One named Beautiful Byzantine and one called Beautiful Turquoise Handmade Jewelry. It's hard to say which piece of mine chosen I like better. The bracelet in the Byzantine collection I wear often. I've also made and sold a couple so it's certainly one of my favorites. On the other hand, The bracelet included in the Turquoise collection I've designated as my signature piece since I first started making jewelry. I've sold it in it's original Turquoise color, and also in Picture Jasper with Swarovski light amber crystals and 14K gold filled jump rings and with Carnelian, a beautiful red stone with Swarovski copper colored crystals and copper jump rings. It's just such a fun bracelet to make and looks fabulous when you wear it. Another thing that happened this week was that Saturday my Dad had a mini-stroke and lost the hearing in his right ear. So now he's in the hospital and, at 86, has to decide if he's willing to go through an operation to clear his arteries or whatever it is they do. Yeah, I'm a bit worried, so I may not have much to report next week. Except, hopefully, good news. He's still a man in great humor and the only thing he really wishes is that he had a computer to use at the hospital. My old man is a techy at heart which proves you can teach an old dog new tricks. :) Prayers and well wishes accepted. Lastly, another pair of my earrings was featured in another Etsy treasury, not your grandmother's pearls....... LOL, hey, I didn't come up with the Treasury name so don't blame me. But it's true though, these are NOT your grandmother's pearls. I just gotta say that my fellow artists and artisans at the Florida Etsy Street Team ROCK!! I'm off to the hospital tomorrow to see Dad so I'll log off for now. At least I kept my promise and wrote something even if it's something about nothing. They say it's lonely at the top, but you know, it's just as lonely at the bottom. Maybe more so. I've been on the bottom for awhile now and it's one of the reasons I haven't posted here on the blog. So, I'm going to climb the ladder and try something new. Once a week I'm going to talk about jewelry or crafting or art or, well, anything inspirational that comes to mind. This being May, I decided to create a Treasury over at Etsy. 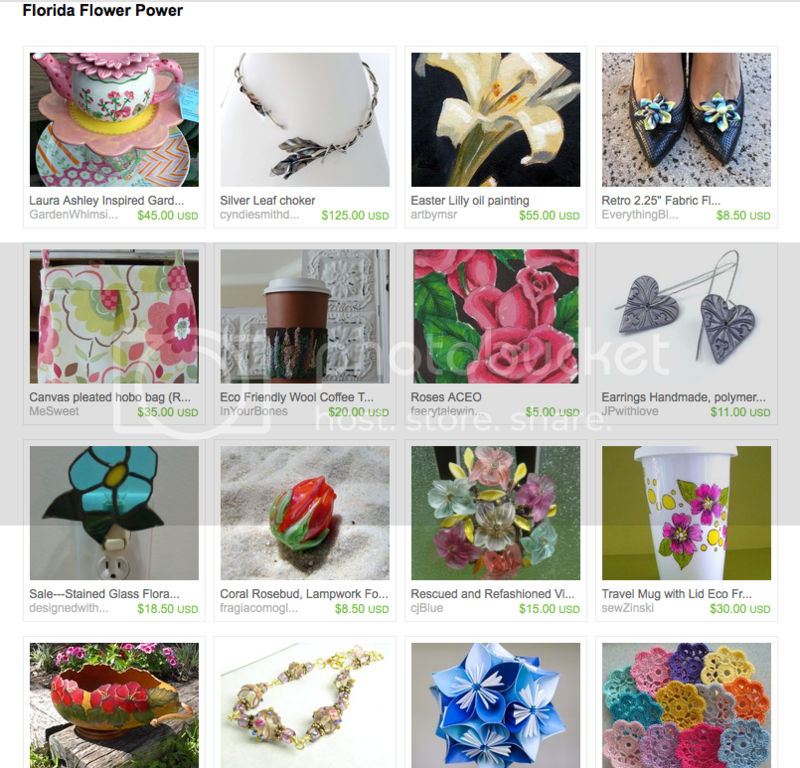 It's called Florida Flower Power and it is a selection of some of the prettiest, flower inspired works from my fellow teammates at the Florida Etsy Street Team or Team Fest as we fondly call it. Some of these people are artists, jewelry designers, beaders, sewers, crafters and much, much more. They are talented, creative people who just happen to live in Florida and have inspired me. None of my own work is in this Treasury. But I hope you'll hop on over there and take a little time to stop and smell the flowers. I have.